Lest future visitors think otherwise, the image of warm, blue sea and beautiful beaches must be reinforced again and again and again in the region’s marketing. I mention this because I was reminded this morning of a Caribbean marketing expert I heard speak who extolled many virtues of the Caribbean but failed to mention any of these. Goes to show that we have difficulty appreciating the characteristics that are to us same-ol’ same-ol’, forgetting that to a visitor these things are W-O-W.
Barbados' beautiful beaches, this one Carlisle Bay (Browne's Beach). Feels good to remember this slice of heaven exists at the end of a relatively short plane ride. I’m an “outsider” – a Yank married to a Bajan – and I hope that when it comes to my perspective of this beautiful paradise of Barbados I long remain so. 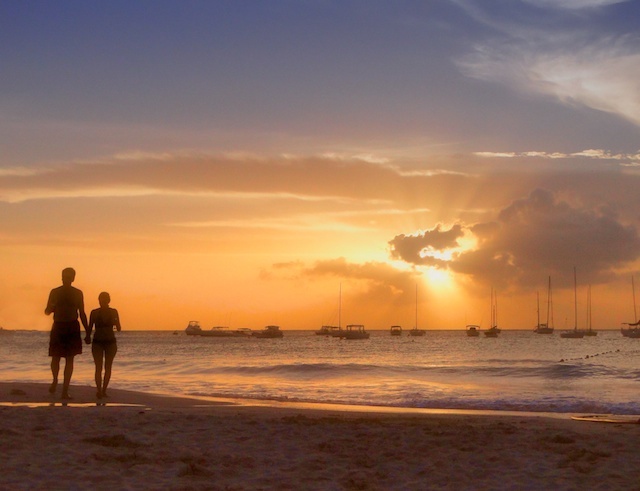 Have a grand day … and enjoy Carlisle Bay (aka Browne’s Beach). Loved the video. Makes me want to come down there right now. Simply beautiful. jane, excellent video, pebbles beach is my absolute favorite place in the world…can’t get enough.